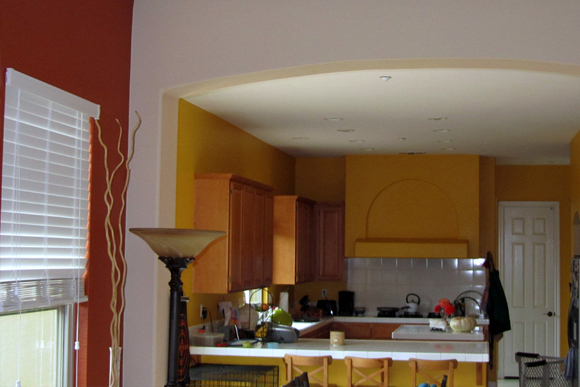 My brother lives in San Diego, and bought a home with a completely open first floor that is divided by arched openings. 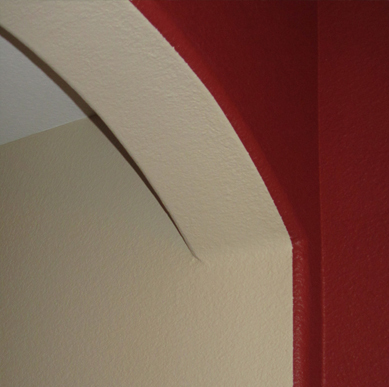 The openings are finished with bullnose drywall corners leaving nowhere to transition colors between rooms because there is no sharp corner to make the transition. The house had the original builders white paint job when they moved in. He and his wife wanted to warm the house up and also add some punches of color. They asked for my help to create a color scheme. I believe most homes feel more cohesive when the trim color remains the same throughout, so we left the white paint on the trim. With the open floor plan I felt we needed an anchoring color. 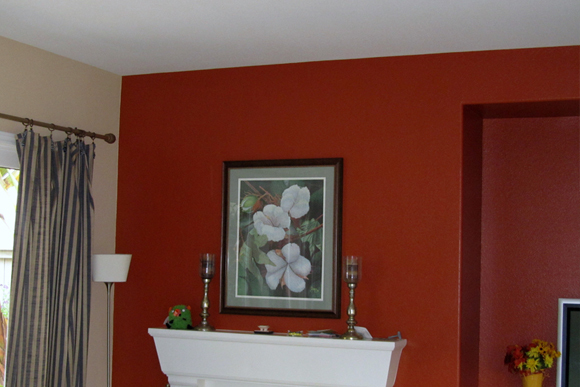 My recommendation was to paint the entry a warm khaki and allow it to flow into each adjacent room until it hit an inside corner, at the inside corner we then transitioned to the accent color. 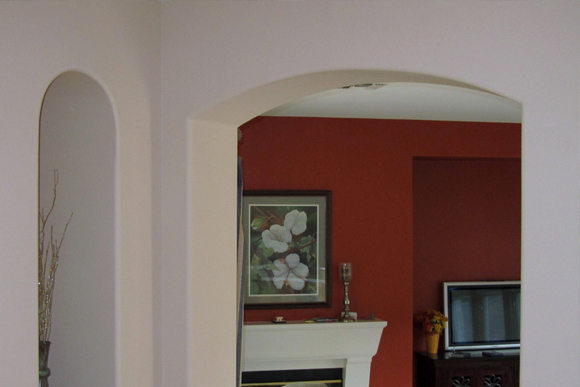 As you look from room to room your views are framed by the arches which are all painted the soft khaki color with punches of the bold colors beyond. The view from the foyer looking into the kitchen is framed by an arch. The khaki ties the house together. In the small hall connecting the dining room and kitchen we had to break the color on the bullnose bead. The painter did a nice job with it, but I would hate to see this in a main area of the house. Bruce Gingrich is a residential designer and custom builder based in New Holland, PA. His company, Glenn Gingrich, Inc. is a design, build, remodel firm that executes projects from conception to completion. His functional insight, meticulous planning, building expertise, and customer collaboration can give you the living space of your dreams. This entry was posted in Details and tagged color, Design Concepts. Bookmark the permalink. Bruce did a great job of understanding what kinds of colors we like, as well as thinking through how they all go together to make the house look unified, but with unique character in each of the rooms. 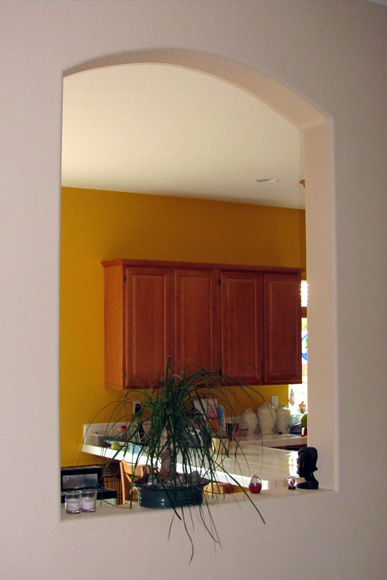 The yellow he suggested for the kitchen was much bolder than what I would have chosen myself, but now that it is in the room I really love it and it makes for a bright, cheerful gathering place for our family. The terra cotta in the family room is my favorite. Bruce’s design sense really added to the livability and enjoyment of our home! For the past 22 years I have been designing and building homes and additions. I have learned a lot about collaborating with people to help them achieve a home that is both beautiful and functional. I've developed insights into improving how people live in their homes and a lot of design ideas, this is where I share them. I hope you find these blogs interesting. If you are looking to make changes to your home--or tear it down and start over again--don't hesitate to contact me. I would love to have the opportunity to work creatively with you. And, yes, if you've seen it on HGTV, we can do it. All pictures, unless noted, are Glenn Gingrich, Inc. Projects. Our Contemporary Bath Makeover Won! Great Design Bang For The Buck – Completed!